Is it just me or did the lazy days of summer just end with a sudden, jarring halt and did we just get thrown headfirst into the very busy workdays (and otherwise) of fall? I’m looking forward to the weekend more than ever and it’s only Tuesday (*cry face emoji*). This is probably why I’m thinking wistfully back on our relaxing vacation in Hot Springs, VA just a couple weeks ago. It’s a bit cooler down there so I was able to start dressing a little bit more fall-ish (without the added stress that comes with the hectic fall schedule). I’m a huge fan of wide chokers right now and love that it’s a trend that easily bridges across the seasons. What fall trends are you excited about? 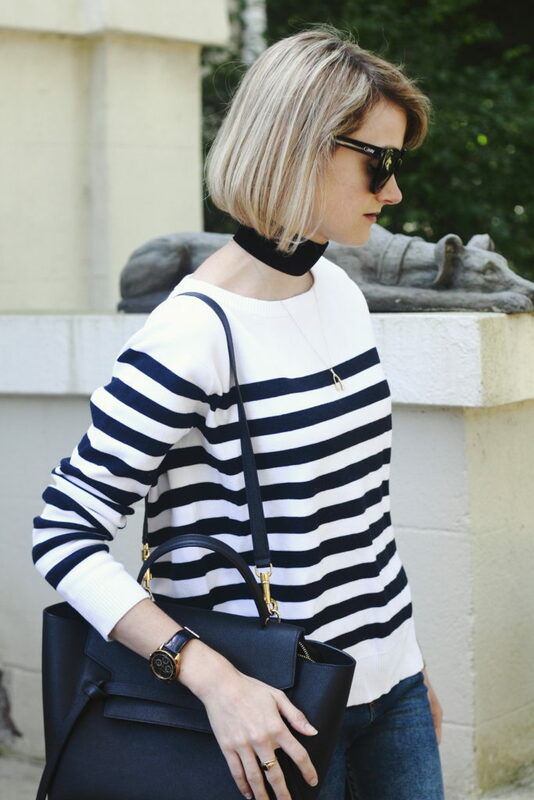 Loving this preppy look, that striped sweater looks so comfy! 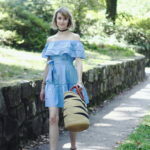 Such a gorgeous bag, and I’m loving your sandals too! I’m definitely excited about chokers this Fall too! loving those sunglasses! you look so chic! I just love visiting your blog. You are seriously always so chic and stylish without looking like you are trying too hard. Love the hem of this denim and the choker. The classic stripes pair so well with those more modern elements. This outfit is gorgeous! I love the thick choker and the jewelry! This look is amazing! I love the choker more than anything! Love this casual look! You can never go wrong with stripes! The bag! The stripes! Your hair! All so beautiful. Lovely look! Love this outfit!! Those sandals are perfection! Your choker is perfect with the top! I’m loving all of the flared pieces for fall! Feel free to enter my latest giveaway for the little one 😉 My, how time flies!! Oooh I love this with the black choker. So chic. No mom jeans for you hottie!